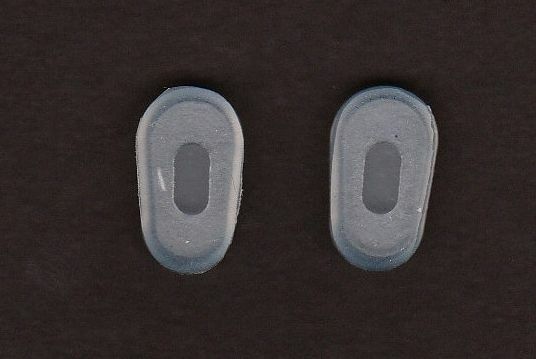 Slip-On Nose Pads Nose Pad Cushions - Large 16.5mm Soft Silicone 5 Pairs | QTE North Ameri | QTE North America, Inc.
Slip on nose pads were originally designed to fit the Pince-Nez eyeglasses, like President Roosevelt wore. Those eyeglass frames have no temples, the nose pads pinch the nose to hold the eyeglasses in place. Some folks like to slip them over the hard plastic nose pads on their eyeglasses and sunglasses for a little extra comfort. They are a much better choice than using bunion pads. Slip-On nose pads look like little Mickey Mouse shoes. Good for craft projects, too. Like all nose pads, we recommend that slip on nose pads be cleaned with a little liquid soap and water from time to time. This will remove the oils from your skin, lotions, make-up, etc. that can build up.